Announcing the release of new product for iPad users called Clasp. We know that many people was asking and waiting for this product and the day has come, Clasp will keep your case closed and provide a better protection. The Clasp is mixed closely with look and functionality of Apple case, and keeps your case securely closed. 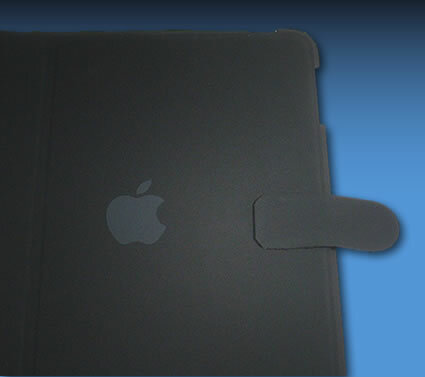 It is constructed from a similar black rubber material and attaches with double-sided adhesive to the front. Once attached, the Clasp adheres to the back of the Apple case with a Velcro tab and holds both sides closed. The Clasp is easily removable, easy to open and close and serves for best security and consumer satisfaction. Protective Clasp is available at the price of $9.95 (USD) directly from the newPCgadgets website. newPCgadgets is a leader in iPad accessories. Top selling iPad products include: the Security Case for the iPad, the Pedestal Base for the iPad, and the Vanity Plate for the iPad. The Clasp is available directly from the newPCgadgets website.